Belgium, France, Germany, Luxemberug, April 2014. In the Breeding, Selection & Distribution Project we will use Single Drone Inseminations (SDI) and brood Varroa counting to search for Varroa Sensitive Hygiene (VSH) behavior; the behavior were the bees remove brood that is infected by Varroa mites. Several groups (representing the different races/lines) will be formed in the coming 2 years. For the Buckfast part of the project the following group of has been formed: Riad Abara, José Artus, Pascal Boyard, BartJan Fernhout, Didier Geuten, Jos Guth, Paul Jungels, Jean-Marie Lavend’Homme, Renaud Lavend’Homme, Pierre Marin, Philippe Lambert, Bernard Leclercq, Julien Perrin, Jean-marie Van Dyck. 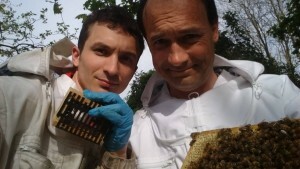 Julien Perrin and Pascal Boyard (see photo’s) started early April with the first Single Drone Inseminations, establishing the real start of the project. In the coming months the group will strive to create between 100 and 200 single-drone colonies.